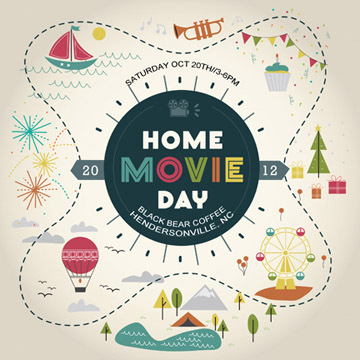 Join us for Home Movie Day! Members of the public are invited to stop by between 2-4pm and bring their home movies to our local event where they will be inspected by HMD projectionists and shared with an enthusiastic audience in a celebration of amateur filmmaking and home movie preservation. We will show your home movies on Super 8mm, Regular 8mm, 16mm film, VHS, VHS-C, or miniDV! Home Movie Day events provide the opportunity for individuals and families to see and share their own home movies with an audience of their community, and to see their neighbors’ in turn. It’s a chance to discover why to care about these films and to learn how best to care for them. Information about film preservation and video transfer facilities in our area will be available at the event! Bring your home movies to share, or just come enjoy the memories! 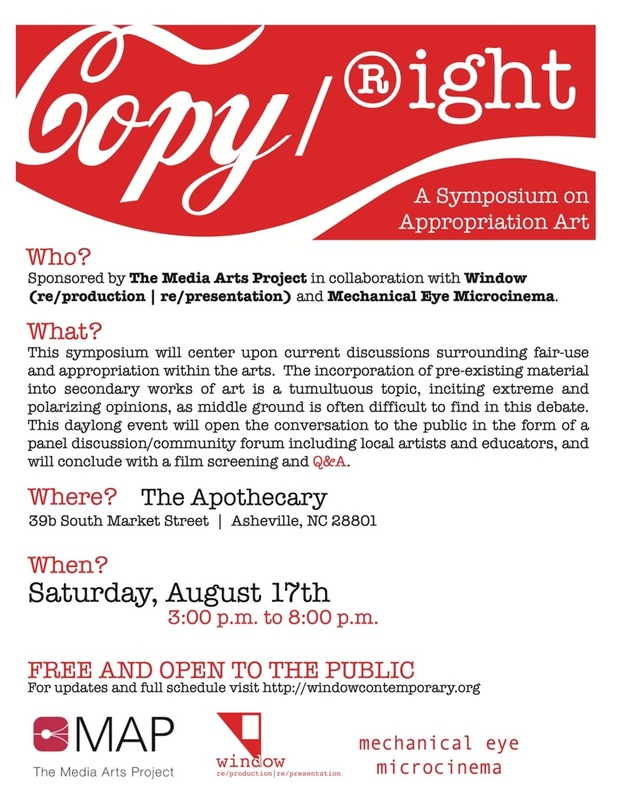 We’re pleased to collaborate with the Media Arts Project and and Window (re/production|re/presentation) on a symposium about appropriated art. This screening will consist of shorts that appropriate images and sound into videos with new meanings and messages that subvert mainstream media culture. Including found footage, corporate monolith cartoon characters, vidding, clips of documentaries about copyright and remix culture, and a pinch of North Korean propaganda parody. One night is not enough time to throughly represent the history of appropriation in film, however, we will give you a taste of the process and legal challenges over recent decades. We hope, after viewing, you will feel compelled to steal some footage and make your own re-mix masterpiece. Details about the entire event below or at this website. Mechanical Eye will present “The Heroines of Handcrafted Cinema” at the BeBe Theater, as part of this year’s Impractical Labor in Service of the Speculative Arts (ILSSA) conference taking place July 5-7th. For this program, we’re teaming up with filmmaker Kelly Gallagher, the curating genius of Philadelphia, to present films by women who labor for their art impractically. The heroines of “handcrafted” cinema animate moving images that are literally and tangibly created by their own hands — images that are crafted, painted, torn up, spit up, chewed out, glittered up, collaged, drawn, painted, puppeteered, sewn, hand-processed, bleached, scratched, made with love, made with hate, and made with everything in between. Impractical Labor in Service of the Speculative Arts is a membership organization for those who make experimental or conceptual work with obsolete technology. The goals of ILSSA include: (1) the establishment of a Union to foster community, solidarity, and peer review; and (2) the formation of a Research Institute to support new ideas, communications, and resources. Impractical Labor is a protest against contemporary industrial practices and values. Instead it favors independent workshop production by antiquated means and in relatively limited quantities. Economy of scale goes out the window, as does the myth that time must equal money. Impractical Labor seeks to restore the relationship between a maker and her tools; a maker and her time; a maker and what she makes. The process is the end, not the product. Impractical Labor is idealized labor: the labor of love. Filmmakers Roger Beebe, Robert Edmondson, and Nick Mendez in person! Filmmaker Roger Beebe will present his multi-projector performance “Films for 1 to 8 Projectors.” Beebe will be running as many as 8 projectors simultaneously, projecting short films made and projected in a variety of formats (video, 16mm, and Super-8). 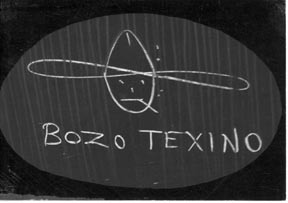 The films combine found footage and Beebe’s own striking handmade images. 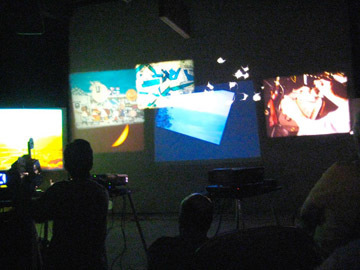 This work can only be screened with the filmmaker actually running the projectors, and running from projector to projector. Florida filmmakers Robert Edmondson and Nick Mendez will also be projecting cameraless films, both projecting originals — which means no other copy of this work exists! Cameraless films and videos by Jodie Mack, Ben Popp, Scott Fitzpatrick, Kelly Gallagher, Joshua Solondz, Devon Damonte, Gregg Biermann, Matt Gossett, Lauren Cook, and others! With a special showing of Madame Winger Makes a Film! Short drama and feature films vary from some set on the streets of India, Moscow, Mexico City or Tokyo, to one smuggled out of Iran. The US entries provide dramatic looks at injustice against the Japanese Americans during World War II, and range from comic to tragic looks at society’s misfits and dysfunctional families. The award winning short film this year is Mousse, a comic look at robbery and justice. Documentary films range from films examining a massacre in Afghanistan to dancing in the Appalachian Mountains. The Animation and Experimental film categories are also well represented. What’s not to love about Portland, Oregon – mountains, trees, tons of musicians, filmmakers and other creatives, and donuts. Portland is also a hotbed of experimental film. 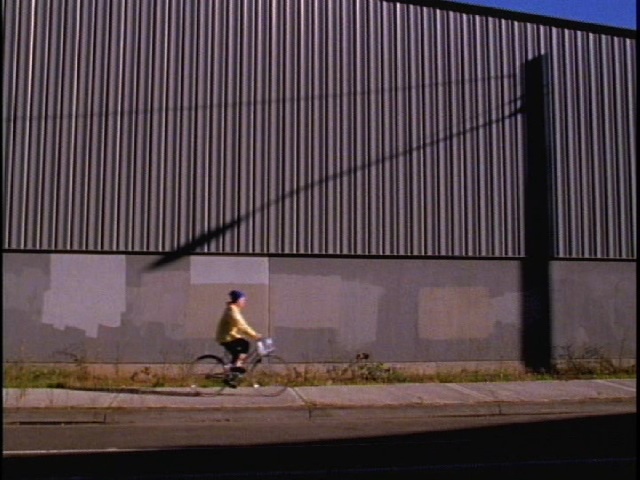 We’re proud to share some selections of great Portland filmmakers with you. 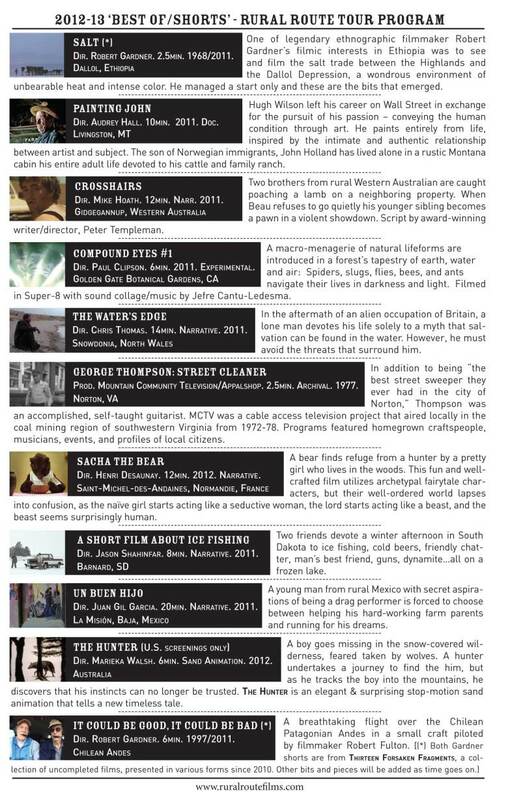 The line-up is still percolating, but we know you’ll love these cool films blowing in from the Northwest. Line-up will include films by Matt McCormick, Ben Popp, and more. The Rural Route Film Festival was created to highlight works that deal with rural people and places. The creators of Rural Route Film Festival leave it up to the film and video artists to express their unique definitions of “rural” – whether it be a documentary about an organic turnip farm in West Virginia or a fictional backpacking drama set in Peru. Based in New York, this film festival takes place in the summer and tours the country during the rest of the year. We’re excited to host this “best of” program for Asheville audiences! One of legendary ethnographic filmmaker Robert Gardner’s filmic interests in Ethiopia was to see and film the salt trade between the Highlands and the Dallol Depression, a wondrous environment of unbearable heat and intense color. He managed a start only and these are the bits that emerged. Hugh Wilson left his career on Wall Street in exchange for the pursuit of his passion – conveying the human condition through art. He paints entirely from life, inspired by the intimate and authentic relationship between artist and subject. The son of Norwegian immigrants, John Holland has lived alone in a rustic Montana cabin his entire adult life devoted to his cattle and family ranch. writer/director, Peter Templeman. Dir. Mike Hoath, 12 min. 2011. Narrative. Gidgegannup, Western Australia. Two brothers from rural Western Australian are caught poaching a lamb on a neighboring property. When Beau refuses to go quietly his younger sibling becomes a pawn in a violent showdown. Script by award-winning writer/director Peter Templeman. Dir. Paul Clipson. 6 min. 2011. Experimental. Golden Gate Botanical Gardens, CA. A macro-menagerie of natural lifeforms are introduced in a forest’s tapestry of earth, water and air: Spiders, slugs, flies, bees, and ants navigate their lives in darkness and light. 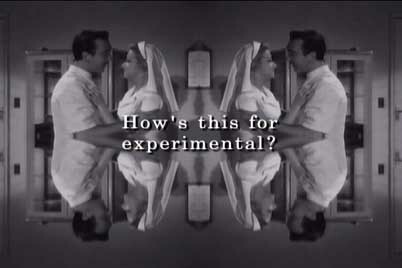 Filmed in Super-8 with sound collage/music by Jefre Cantu-Ledesma. Dir. Chris Thomas. 14 min. Narrative. 2011. Snowdonia, North Wales. In the aftermath of an alien occupation of Britain, a lone man devotes his life solely to a myth that sal- vation can be found in the water. However, he must avoid the threats that surround him. In addition to being “the best street sweeper they ever had in the city of Norton,” Thompson was an accomplished, self-taught guitarist. MCTV was a cable access television project that aired locally in the coal mining region of southwestern Virginia from 1972-78. Programs featured homegrown craftspeople, musicians, events, and profiles of local citizens. Dir. Henri Desaunay. 12 min. 2012. Narrative. Saint-Michel-Des-Andaines, Normadie, France. A bear finds refuge from a hunter by a pretty girl who lives in the woods. This fun and well- crafted film utilizes archetypal fairytale char- acters, but their well-ordered world lapses into confusion, as the naïve girl starts acting like a seductive woman, the lord starts acting like a beast, and the beast seems surprisingly human. Dir. Jason Shahinfar. 8 min. Narrative. 2011. Barnard, SD. Two friends devote a winter afternoon in South Dakota to ice fishing, cold beers, friendly chat- ter, man’s best friend, guns, dynamite…all on a frozen lake. Dir. Juan Gil Garcia. 20 min. Narrative. 2011. La Mision, Baja, Mexico. A young man from rural Mexico with secret aspirations of being a drag performer is forced to choose between helping his hard-working farm parents and running for his dreams. Dir. Marieka Walsh. 6 min. Sand Animation. 2012. Australia. A boy goes missing in the snow-covered wilderness, feared taken by wolves. A hunter undertakes a journey to find the him, but as he tracks the boy into the mountains, he discovers that his instincts can no longer be trusted. The hunTer is an elegant & surprising stop-motion sand animation that tells a new timeless tale. Dir. Robert Gardner. 6 min. 1997/2011. Chilean Andes. A breathtaking flight over the Chilean Patagonian Andes in a small craft piloted by filmmaker Robert Fulton. 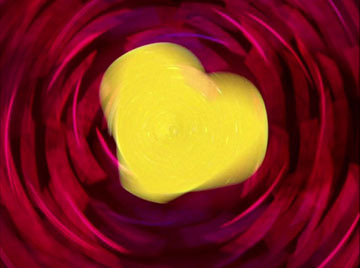 Join us for a shorts program of sweet/sad films about love/heartbreak. These films are a mix of handmade, animated, collage, cut-paper animation, live action, and even a glitched video game. Films will be shown on video and 16mm. Come prepared for beauty, humor, cuteness, romance, strange, and a little bit of sad, and if you’re good, you might even get some chocolate with your films. 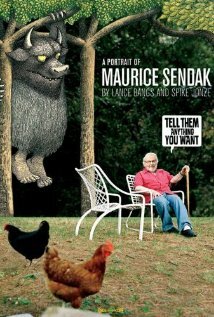 From Lance Bangs and Spike Jonze, acclaimed director of WHERE THE WILD THINGS ARE, comes A PORTRAIT OF MAURICE SENDAK, a loving look at one of the most cherished and controversial figures in children’s literature. Featuring TELL THEM ANYTHING YOU WANT, this is a deeply moving tribute to Sendak, a seminal talent whose conflicts with success and lifelong obsession with death have subtly influenced his work. Sendak is best known for his book, WHERE THE WILD THINGS ARE, which he wrote twelve years into his career as a writer and illustrator. WILD THINGS would go on to become one of the most beloved and critically lauded children’s books of all time and, much to Sendak’s chagrin, would come to define his career. Through his own words, personal photos, and illustrations, Sendak offers a rare, intimate, and unexpected look at his exceptional life. Join us to remember and discuss Shirley Chisholm’s bravery and eloquence on the 40th anniversary of her run for president. Chisholm fought to be heard and to be taken seriously – a feat she accomplished, even if she failed to win her party’s candidacy. Eloquent speeches, psychedelic campaign posters, and fiery social justice rhetoric – this documentary film examines her run for president with a remarkable depth. With George McGovern’s passing last month, it’s a good time to reflect on this time period and the evidence of how much the social and economic policies of both parties have changed. 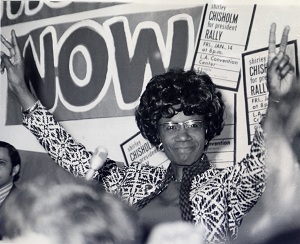 One newscaster in the film described Chisholm as “throwing her bonnet in the ring.” There’s no doubt much has changed in 40 years, however we know that if Shirley Chisholm ran today she would still face significant challenges. Home Movie Day is a celebration of amateur films and filmmaking held annually at many local venues worldwide. 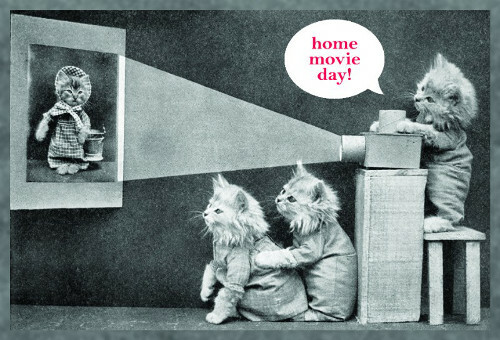 If you have home movies on film that you’ve never seen, or haven’t watched since you inherited them from your grandparents–bring them to Home Movie Day! We will have the capacity to show S8 and 16mm films. Home Movie Day gives people the opportunity to see and share their home movies with their community, and to see their neighbors’ in turn. It’s a chance to discover the value of these films and to learn how to care for them. 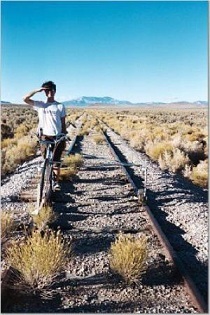 The theme is vagabonds, travelers, towns and trains, and places left behind. These three films are ghost histories about space and an America that once was. A disused gas station offers a curious imperative to passersby: “SAVE.” A riddle posed in the form of architecture: what is there to save? One more installment in the history of Americans pointing their cameras at gas stations; an attempt to figure out something about where we’ve been, where we’re headed, and what’s been left behind. HUB CITY is a short about Lubbock, Texas, the home of Buddy Holly. It is also about trajectories of death and small towns in general. Filmmaker Bill Brown will be in attendance to introduce his film Hub City and to answer questions.